VersatileDogs.com • View topic - How versatile is your dog? How versatile is your dog? 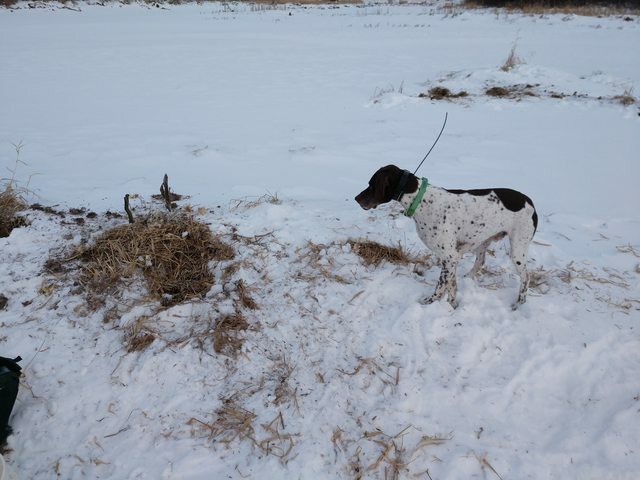 For being a liver and white field trial shorthair who wasn't really supposed to be versatile (according to the breeder), he has turned out to be incredibly versatile from his very first hunt. Obviously he will do the upland. That's his bread and butter. He will hunt ducks and geese in any conditions that are above zero degrees, on land or water or ice. Now that bird season is over in Idaho, my only outdoor activities have been running a pretty decent trapline for both water and land animals. I bring him with me on both land and water lines. Having a dog on a canine trapline is actually a big help especially this time of year in breeding season. Coyotes and wolves will mark territory on areas he pees and visa versa for him to where they pee. I can set traps at these marking locations. Basically, he shows me where they are peeing. His footprints in the snow help the wild canines feel more comfortable and less skittish. Today while I was making a set, he was hunting mice and voles in the snow covered brush. He dug me a nice dirthole with nice eye appeal for any canines in the area. His footprints all around the set and he marked near the set as well. So I threw some beaver meat and smelly lure down in the hole, covered it with some light snow and brush/grass and put a trap in front of it. All he needs to do now to be totally versatile would be to locate fish underwater for me. Re: How versatile is your dog? I took up trapping when I was 11 using a No. 1 Victor longspring I found hanging on a nail in my Hillbilly Great Uncle's Ozark barn. Muskrats were my first quarry. I bought a dozen more traps and a one man inflatable raft, latched on to an old pair of ripped hip boots, and went paddling down the local creeks and small rivers making and checking sets. It quickly grew in scale from there. Many trappers find benefits from a good dog accompanying them on the trapline just as you describe. Add to it the dog helping to locate game tangled in nearby brush when using drags vs solid stakes. Pretty common to see an article in Fur Fish & Game along the same lines as your post describing a favorite trapline dog/companion. Thanks for taking us along. I agree a dog along on the trap line will help the trapper make sets, never though of them making the coyotes & wolves more comfortable but that makes since also. AG, muskrats are a fun critter. So simple and yet a fun animal to trap. I prefer getting them in footholds as well, but I also use 110s and 160s for them. I hope you still have that Victor #1. The #1 is a good muskrat and mink trap. Forrest, I'll even go so far as to take his umm, how do you say #2 droppings and put them near some of my sets, especially my urine or scent post sets. I typically wear snowshoes which eliminates the standard human footprint in the snow that wild canines can be wary of, so the only distinct prints around are Rowdy's footprints. And yeah it definitely helps them feel more comfortable. If they don't smell his scent, they can still see his footprints and assume it's another wild canine. If they do smell his domestic scent they get really interested and will follow his tracks. When I posted how versatile my Griff Cassie was, I got raked over the coals by all the cat lovers. While helping a friend replace rocks that had washed off his seawall, my first WPG was observing intently. After a minte or so, he began putting his head under water, picking up rocks, and bringing them to me. One of the most cooperative, intelligent dogs I ever had. About as versatile as I need when it is pouring rain and my newspaper is 125ft away from the garage door. flitecontrol wrote: While helping a friend replace rocks that had washed off his seawall, my first WPG was observing intently. After a minte or so, he began putting his head under water, picking up rocks, and bringing them to me. One of the most cooperative, intelligent dogs I ever had. That is incredibly intelligent and observant, wow. But my question is, just how UGLY was he? RowdyGSP wrote: That is incredibly intelligent and observant, wow. But my question is, just how UGLY was he? IIRC,he had pretty good conformation (3 out of 4) and a 3 coat, which was fairly curly and harsh. That said, when walking him once in a park, a passerby commented "That dogs so ugly he's almost cute." Living your best life right there. Rowdy continues to impress. Coveyrise64 wrote: About as versatile as I need when it is pouring rain and my newspaper is 125ft away from the garage door. Except my PP will continue to bring me the neighbors paper if they don't pick them up right away . Rowdy, I thought you might get a kick out of this. 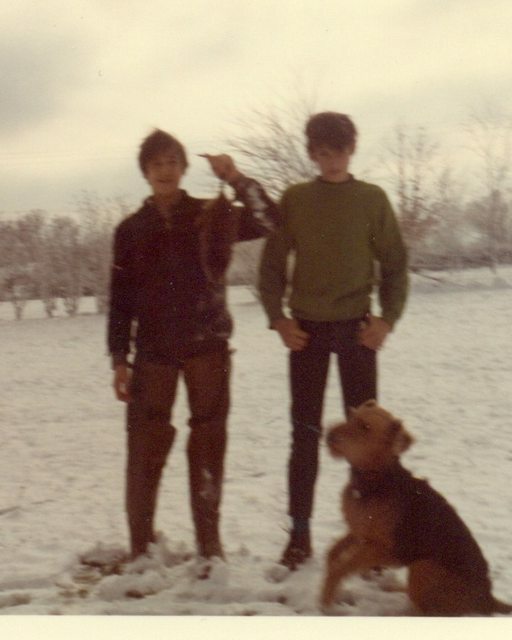 This is me holding the Muskrat, my 1st Cousin beside me, and our Hero Sandy the Airedale. I caught that rat in a Victor no. 1 longspring that morning in a set I made the day before on the river. I had wired it out to deep water as a drowning set, but I am guessing the rat had not been in the set long enough to drown as it was still alive when we arrived. Sandy jumped in the river, swam to the rat and dispatched it in short order. My first experience getting assistance from a trapline dog. That's about as versatile as they come AG. Nice trapline dog right there.